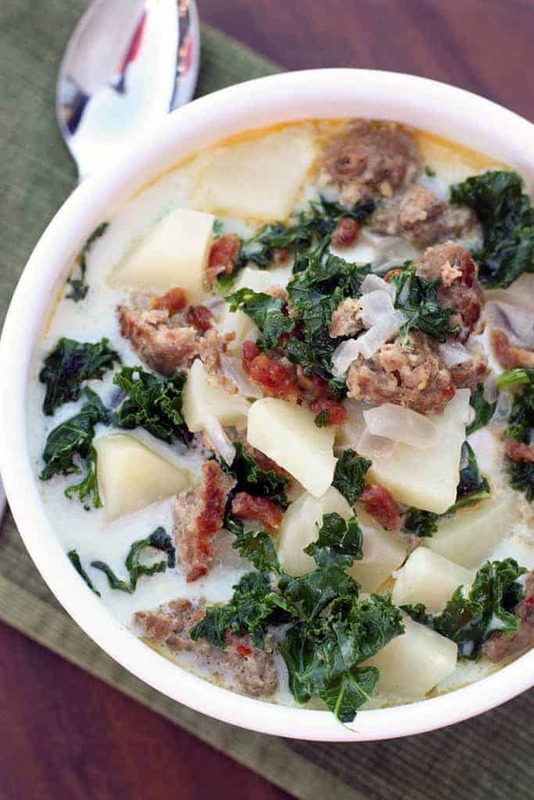 Creamy Italian soup with sausage, potatoes, chopped kale and bacon. 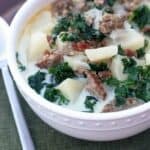 This easy, comforting Zuppa Toscana Soup is always a crowd favorite! I’m such a soup person. It always sounds good, and I especially look forward to the cooler months of the year when I can add soup to our dinner rotation at least once a week! Some of my favorite soup recipes include this Creamy Tomato, Basil Parmesan Soup, Corn Chowder with Chiles , Spicy Chicken Soup and this zuppa toscana soup. This soup was originally made popular by the Olive Garden restaurant, but this homemade version is equally as amazing! 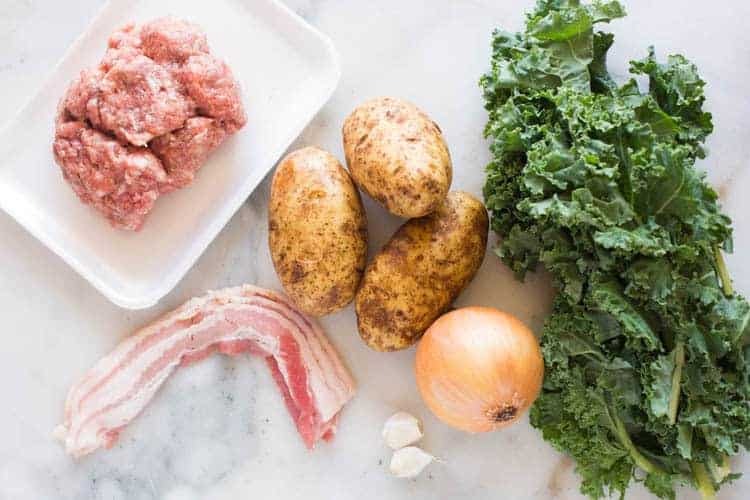 Creamy broth with tender bites of potatoes, kale, sausage and bacon. It’s completely delicious. To make this soup, start by browning the Italian sausage in a saucepan over medium heat. Cook and stir it until it’s nice and brown and crumbled into pieces. Add chopped onion, minced garlic, and chopped potato to the pot. Add chicken broth and water and cook until the potatoes are fork tender. Then add some cream, cooked bacon, and chopped kale. Season it to your liking with some salt and pepper, and crushed red pepper flakes (if you like a little bit of heat). That’s it! What’s not to love about a soup that takes 30 minutes to make (my goal, always), and always gets rave reviews? It’s filling, comforting and just plain tasty! 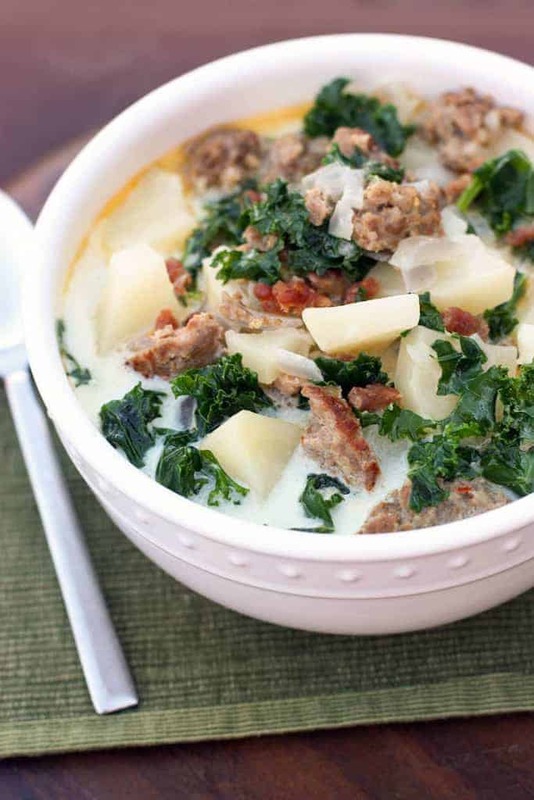 Creamy Italian soup with sausage, potatoes, chopped kale and bacon. This easy, comforting soup is always a crowd favorite! Chop or slice uncooked sausage into small pieces and brown in a large soup pot of medium high heat. Add chopped onions, garlic, and potatoes and toss to combine. Pour in chicken broth and water and allow mixture to come to a boil. Reduce heat to medium low and cook until potatoes are fork tender, about 8-10 minutes. Stir in the bacon, chopped kale, and cream. Season with salt and pepper and crushed red pepper flakes, if using. Cook for 2-3 more minutes. Serve warm. *If you don't like Kale, you can substitute spinach. Since I don’t like kale I made this with spinach and it was just great! Made this today for a gathering. This soup was delicious. I used spinach and all liked the soup. I will make again. I made this the other night. It was delicious and easy. Shared with my neighbors… She said the flavorings were “perfectly balanced”. I agree! This was so delicious! I made it exactly as the recipe said and it was great. I have never been a fan of Kale but love it in this. Thank you for all your meal plans. All your recipes are amazing! Hey Lauren! Thank you so much for this recipe it’s so yummy ,quick & easy!And my husband absolutely loved this soup! I found you today and have spent the past hour looking at recipes. I am SO excited to start making them! I have a toddler and am pregnant so fast, easy dinners are a must. I think you may have just revolutionized my cooking! Thanks so much Lauren! I’m so happy you found my site, and it seems like we have a lot in common already 🙂 ;my name is also Lauren, I have three littles and am expecting in April. Fast and easy dinners are essential! I’d love to hear what you try! Made this soup tonight, exactly as directed but with baby spinach in place of the kale. So perfectly delicious! Will definitely be repeating this one! Hi Joanne, We have been working with our developer to fix the meal plan issue–it should be working for you today–at least by the end of the day. I’m so sorry for any inconvenience! Great! thank you! I will try it out! Still no luck with the custom meal plan. Is it up and running and possibly just me? the orange oval meal “custom meal plan” tab at the top of the page has the Number 5 in a circle showing that my recipes should be saved, but they are not when I click on it.